The advantage of posting for the Barn Door Book Loft is that I get a heads-up when a new book has hit the market. 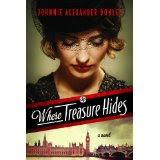 When I did the spotlight for Johnnie Alexander Donley's historical romance, Where Treasure Hides, the excerpt caught my interest and when she told me it was on sale at Kindle for $1.99, I couldn't resist. Am I glad I grabbed it! The story is of a young woman from Rotterdam during the World War II days. She meets a young British soldier in London and it is love at first sight. Of course the war is going to come between them and Alison Shuyler isn't so certain an old family curse might not as well. Alison's family has an art museum and the suspense builds as you see them preparing to hide the old masters in their possession to keep the German Nazis from taking them and destroying them. Add to the mix a German officer in love with Alison and you have an exciting edge-of-the-seat read. One of the things I liked most about Donley's story is her descriptive quality in the scenes she drew. We have visited many of the places she describes and I could picture myself there even though it was a WWII era. If the romantic element in the story doesn't tug at your heartstrings the backdrop of the plight of the children of the war will. As a matter of fact, the first scene where Alison meets Ian Devlin portrays Jewish children arriving in London, sent there for safety by their parents. I could not put this book down once I got into it. Can't say that about a lot of books I've read lately. You won't be disappointed--even if you have to pay full price for it. It's worth the money and the reading time. A fantastic book for the road!